Well it’s been just over 3 years since I actually did anything substantial for charity. My last two endeavors were to climb Mount Kilimanjaro and cycle the South Downs Way. On the 7th of September 2007 at 5,892 meters, I summeted Mount Kilimanjaro with a small group of friends. Raising just over £12,000 for the Amani Children’s Home in Moshi, Tanzania. It was an amazing experience especially spending some time in the home. From January to July 2007 I trained to cycle the South Downs Randonnée. The South Downs Randonnée is a long distance bike ride, 100 miles, and is a significant test of endurance as over the drooling 100 miles you also have over 10,000 feet of climbing! I would not recommend this unless you are an experienced off-road biker, but if you are you will absolutely love this challenge. The Randonnée route travels the full distance of the South Downs Way. It starts at Winchester, Hampshire and finishes in Eastbourne, Sussex. 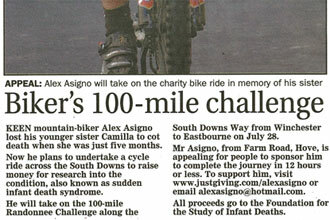 I raised just over £2000 for the Foundation of Infant Death. I’m still deciding on what adventure I should take next? For the last while I’ve been thinking about climbing Mount Cho Oyo, but this is just too expensive for me at the moment. Secondly walking the Bering Straight, after reading of several people having issues with entering Russia without going through border patrol such as Karl Bushby who was arrested. Canoeing the Amazon would be great, but I don’t think I could afford to take enough time off to canoe 4,345 miles. So I would have to downscale it and canoe the Huallaga River which is a more modest 680 miles. These all sound great, but I’m not living in Australia which make them considerably more expensive to do. So I’m now thinking of something easier to plan and undertake, something like the Kokoda track would be great. But is too short for a real adventure, as it could be hiked in 3 days, it’s 60 miles long. I’m still thinking the Kokoda Track/Trail would be great to do. It’s a single-file foot way which runs 60 miles through the Owen Stanley Range in Papua New Guinea. The Kokoda track starts at Owers Corner and then crosses rugged and isolated terrain, rising to a height of 2,190 metres and only passable on foot, and then along to the small village of Kokoda. If anyone out there is reading this who has walked this I would love to hear from you. I contact you because we are both travel bloggers and probably have an overlapping audience. We could share that audience. I hope to globalize humanitarian aid by proving it is perfectly possible to remain independent of large bureaucracies – because the internet allows us to establish the right contacts. I simply offer you a mutual link to attract attention to both our ventures. I love your intentions and I really think all travellers and travel bloggers should take a leaf out of your book and get behind a cause, it’s an inspiration and one I’m definitely going to act upon! Keep it up! Any update on you plans? I’d be up for something… perhaps in a couple of years oncemy course is over!